I grew up in rural Brazil, either in the South or the Northeast. Both experiences shaped me and my relationship to the Earth. In the South, we had a farm and took care of chickens, cattle, horses, pigs, ostriches, lambs, and our main crops were coffee and sugar cane. At the time, I didn’t know I was going to be a chef, but I felt deeply connected to the land. Once I was older, we moved to the Brazilian northeast coast and my long walks with our dog Falcão on the beach made me realize that the world was vast and I needed to explore it. I was given the opportunity to come study English in Canada and once I was here, I enrolled in the Culinary Management Program at George Brown College and from there worked in various Toronto culinary institutions such as Copacabana, Nota Bene, OMAW and Canis. In between that time, one of my biggest influences was Chef Masaki Nakayama at Shibui who mentored me in Japanese cuisine and taught me the skills I needed to advance my cooking techniques. To further my curiosity, I have traveled to Morocco, where I ran a restaurant called Restaurant 7 in Fes for 3 months, as well as doing a pop up in Marrakesh and finally staging in St. John in London, UK before returning to Canada. One of my most memorable trips was to Peru, where I was able to experience their cuisine at all levels, from Michelin Star restaurants to street food. My mind was blown by how street food was almost just as impressive as fine dining restaurants and I wanted to know more. The quality of the local food was unbelievable and gave me inspiration to create the menu at Casa Fuego as a place for everyone to experience the vast world of Nikkei and South American cuisine. 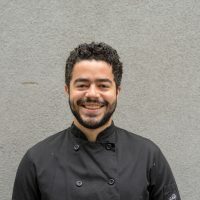 Gastao and Chef Michael Lam met at Omaw restaurant in 2017 and have stayed close ever since; building and growing from each other has been an integral part of their progression.